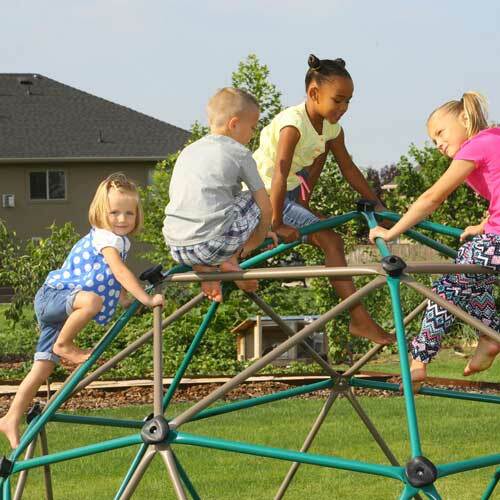 Give your children, ages 4-12, toy that will provide hours of fun and exercise outdoors. This unit comes in Earth Tone Colors (Green, Tan, etc.) and looks nice on just about anyone's lawn. Parental supervision is required when children are at play. 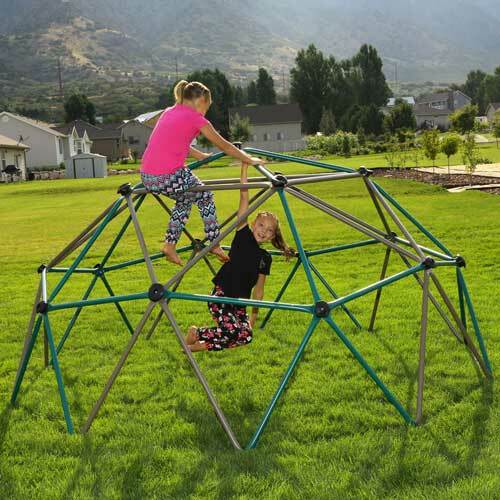 It has come to our attention that on some packaging for this Dome Climber, the weight limit is shown to be 400 lbs. After checking and rechecking with Lifetime, we have verified that the correct weight limit is 600 lbs. as originally listed, and that the packaging is incorrect if 400 lbs. is shown. We sell many outdoor products, including Basketball Hoops, Teeter Totters, Picnic Tables, and Lifetime Swing Sets. This product comes with a 1-year warranty from Lifetime Products. 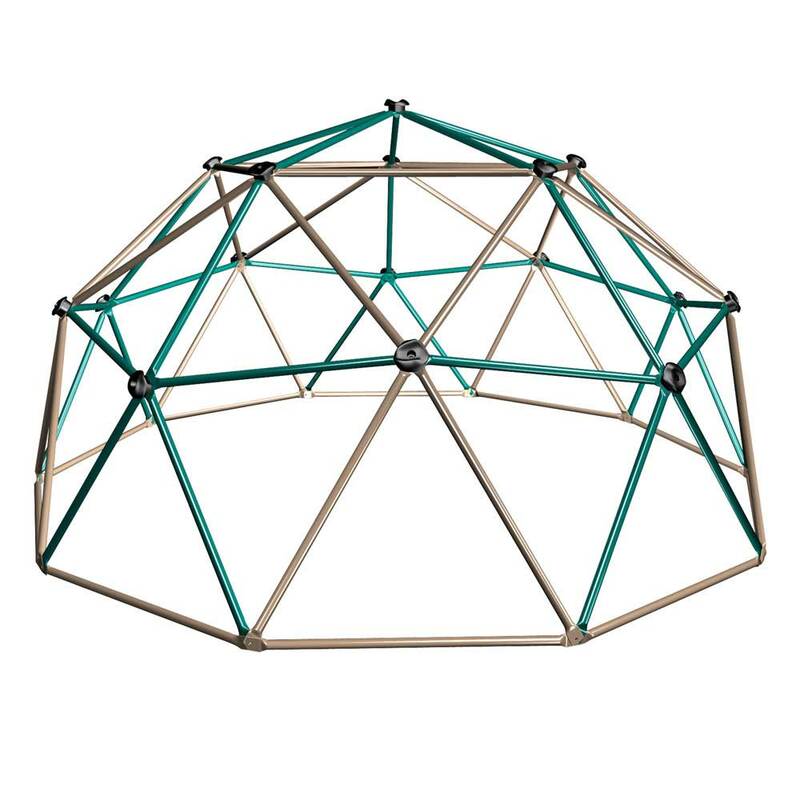 All metal components of the 90136 dome climber are powder coated, which helps the metal resist rusting. Product measures 5 Ft. tall and 10 Ft. in diameter. Hand grips included to help children climb and keep their grip. 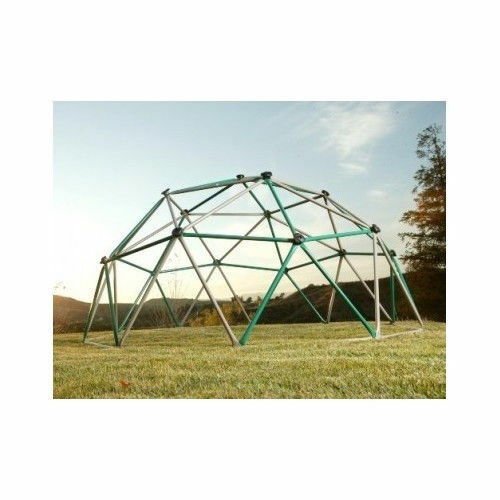 Powder-coated steel structure designed for sturdy support. Product package weighs about 89 lbs. After using multiple search engines to get the best price for the Geo Climber, Competitive Edge had the best price and shipping options by far. They better than box store,wholesale clubs and large home stores. I am thrilled to buy from here because they offer the best price! Great product, easy to put together. 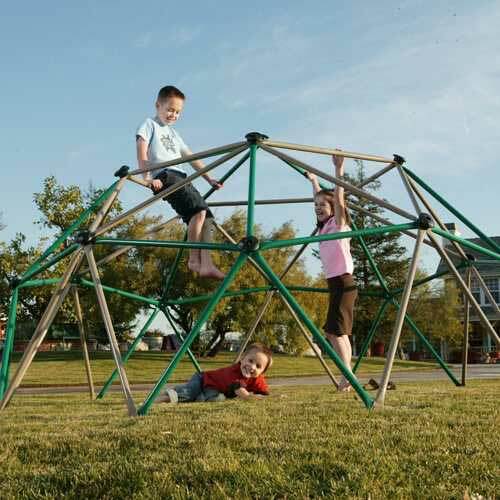 Kids are enjoying playing on this dome. Bought this for our 4 year old grandson. He LOVES it. Took him 2 tries to figure out how to climb it. Our adult children love it too and had to try it out. Very sturdy and was easy to put together using 2 people. Shipped very Fast. After reading and researching everywhere, Competitive Edge Sports had the best price and it included shipping. Which was fast. Product arrived quickly and everything was great. Directions were good and assembly was very smooth. Assembled it myself (not recommended by directions, but) in about an hour. Extremely sturdy and the earth tone colors were excellent. The bars stay cool even in direct sunlight and the dome can be easily moved. Overall, if you are looking for a climber, this is it! My kids, 3 and 5 years old simply cant get enough. Finally I can sit outside while they play. Yes, I get to sit for a little while! 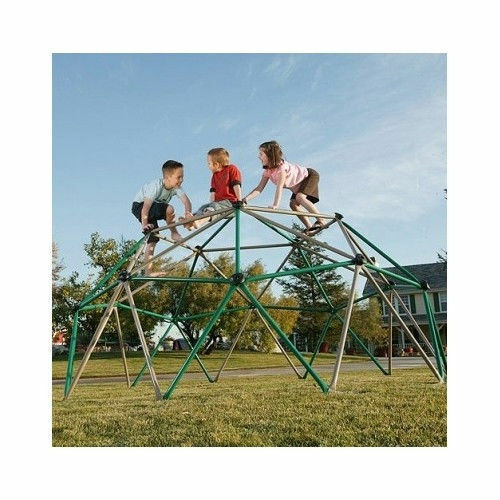 Oh, and it is sturdy enough for an adult, as your kids will want you to play on it too, however fitting through the openings is a bit difficult even for an average adult. In our yard it doubles as a picnic tent as well. This playground was a big hit with my sons four children as well as the neighborhood kids! It came quickly and did not take long to assemble. The price was the reason I purchased it from Competitive Edge. And I love the earth-tone colors! I operate a daycare and had comparison-shopped a number of sources. The cost of this piece of equipment varied greatly for the equivalent item. Your price was the best and free shipping made it even better. Thank you! We are currently assessing the quality of our climber as we assemble it and are favorably impressed. Looking forward to longtime fun for our kids. Q: Do you sell the tent that attaches to the inside of the dome? A: Unfortunately, that is not something we sell separately. Q: Do you ship to Hilo, Hawaii, 96720? If you do how much do you charge? A: Shipping to Hawaii is extremely costly for us, and is about 3 times the cost of the product. We recommend that you have us send it with free shipping to a freight forwarder, and then have them forward it to you. Was this answer helpful? 8 of 17 Customer(s) found this Answer helpful. A: You will want to contact 800-225-3865 for parts. Feel free to contact us with any other questions. Was this answer helpful? 4 of 14 Customer(s) found this Answer helpful. A: This took 2 of us between 2-3 hours to set up. The time may vary based on the number of people you have, as well as how well you are able to set things up. Was this answer helpful? 7 of 12 Customer(s) found this Answer helpful. Q: I want this product, my grand daughter loves it, she have one at her Christian school. Anyway, can I hold this one in my cart till Friday? A: Holding it in your cart does not reserve the item. Whoever orders first gets it first. This is a regularly restocked item. Q: What is the difference between Lifetime Geo Dome 101301 and Lifetime Geo Dome 90136 other than color? A: Besides color there is no difference. Q: What ages does this work with? 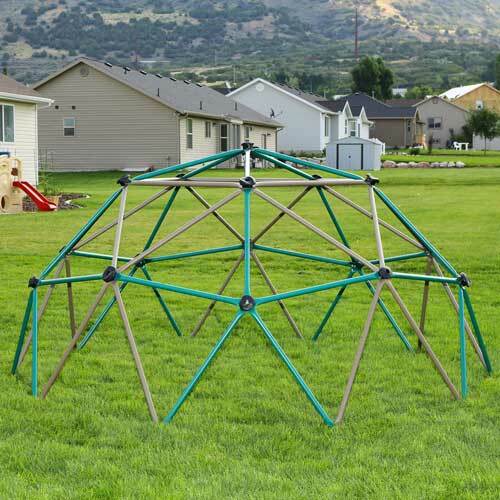 A: Ages 4 to 12 years old-Weight Capacity: 600 lbs. Was this answer helpful? 7 of 10 Customer(s) found this Answer helpful. Q: We are moving from our location about one year. Is it even feasible to put this together, disassemble it, and reassemble it when we move? A: Yes, it can be assembled just as easily as it can be disassembled. Q: Do I need to cover this in the winter to protected? A: It does not need to be covered per se. The parts have a powder-coated finish to protect against rust, but it is possible that rusting may occur after many years. Q: Is there any difference between this 90136 and primary colored one 101301 besides the colors? A: No, there is no difference whatsoever. Q: How long does it take to assembly this climber? A: Assembly time can vary by individual. Typically, two people working on the assembly will take about 4 hours to complete the project. This time could be more or less depending on the individual ability of those helping. 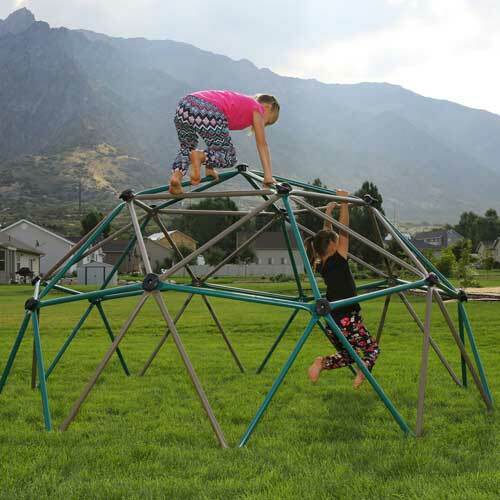 Q: Can older children/adults climb on this product? A: Yes. Please note the weight capacity of this climber is 600 lbs. Be careful to not exceed this weight capacity, or you might risk damaging the product. 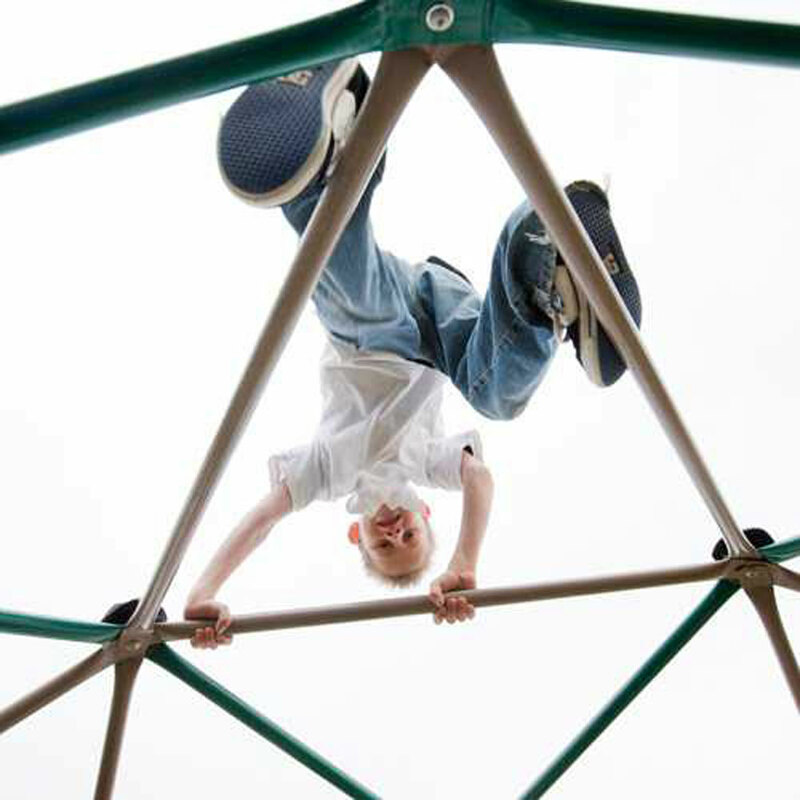 Q: Do you still sell the matching helicopter teeter totter to this dome climber? A: No. Unfortunately, Lifetime Products discontinued the helicopter teeter totter. However, we do still sell the matching earth tone airplane teeter totter. 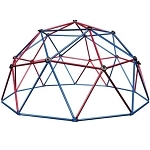 Fast Shipping: Orders for the 90136 Dome Climber generally leave the warehouse the next business day. 49.9 inches x 25.20 inches W x 7.1 inches H; weighs about 104 lbs. Dimensions: 41" x 25" x 8"